Manny Pacquiao and Lucas Matthysse pose for the media ahead of their world title bout. 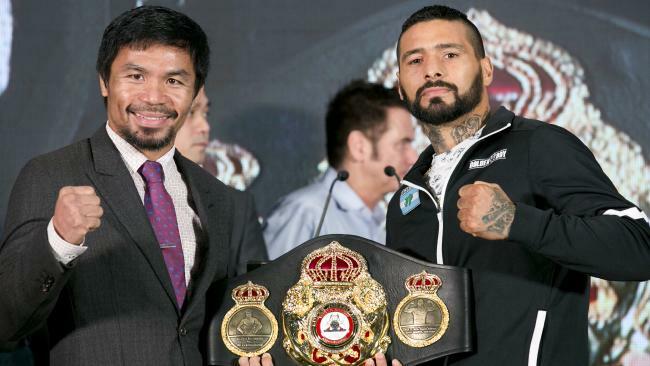 PHILIPPINE legend Manny Pacquiao challenges Lucas "The Machine" Matthysse for the World Boxing Association welterweight belt on Sunday, knowing defeat could lower the curtain on one of the greatest careers in boxing history. Pacquiao, 39, faced calls to retire from friends, family and even his Hall of Fame trainer Freddie Roach after losing the WBO belt to Australian Jeff Horn a year ago. A second successive loss, this time against the dangerous Argentine at Kuala Lumpur's Axiata Arena on Sunday, should have the veteran "National Fist" hanging up his gloves for good. But victory for Pacquiao (59-7-2, 38 KOs), who has won world titles in an unprecedented eight weight divisions in a glittering 23-year career, would extend his legendary status and his life in the ring beyond his 40th birthday in December. "I am not saying it will be the last (fight), but it will be the basis to think about (whether) to continue or not," Pacquiao told AFP at his training camp. But "Pac-Man's" conditioning coach Justin Fortune thinks the world will see "the old Pacquiao" return and silence those who question whether his ageing body still has the ability to compete against the world's best. Pacquiao is going for his 60th victory since turning pro in 1995, but despite winning 38 of his first 47 fights by knockout, he has not stopped an opponent in nine years. "He looks like the old Pacquiao," declared Fortune of the boxer, who is also an elected senator in the Philippines and is tipped one day to run for president. "His metabolism is ridiculous. He's a freak." Matthysse (39-4, 36 KOs) paid tribute to Pacquiao but warned that his admiration for one of the world's greatest pound-for-pound fighters would not stop him from taking his belt back to South America. 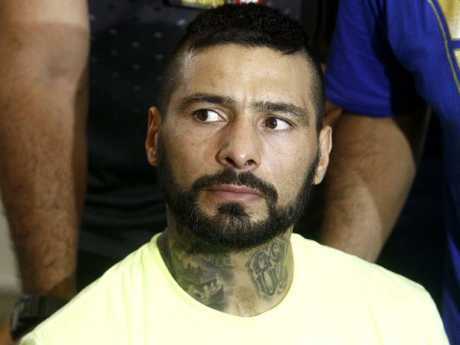 "He is a great champion but he still hasn't faced 'The Machine'," Argentina's Matthysse told a pre-fight press conference. "If he decides to retire after I beat him then that is his decision. I am here to defend my title." Argentine WBA welterweight champion Lucas Matthysse. Knock-out specialist Matthysse has finished 36 of his 39 wins inside the distance and took the vacant WBA belt after an eighth-round stoppage of Thailand's Teerachai Sithmorseng in January. The Malaysian metropolis is hosting world championship boxing for the first time since heavyweight legend Muhammad Ali defeated Joe Bugner over 15 rounds in 1975. And like buses, you wait 43 years for one world title fight and then four come along at once. On the undercard, the interim World Boxing Association featherweight belt goes on the line when Mexico's Edivaldo Ortega (26-1-1, 16 KOs) fights unbeaten Philippine Jhack Tepora (21-0, 16 KOs). Experienced South African Moruti "Baby Face" Mthalane (35-2, 24 KOs) defends his International Boxing Federation flyweight title against the unbeaten, but inexperienced, Pakistani Muhammad Waseem (8-0, 6 KOs). Carlos Canizares of Venezuela (20-0-1, 16 KOs) puts his WBA light flyweight title on the line against Chinese rookie Lu Bin (1-0, 1 KO), who will make history if he wins. Lu, 23, is a former youth world amateur champion bidding to become the first boxer to win a world title in his second professional fight. The record for fastest to a world title, in terms of number of fights, is jointly held by Thai super lightweight Saensak Muangsurin and Ukrainian lightweight Vasyl Lomachenko, who both won championships in their third pro bouts. Manny Pacquiao v Lucas Matthysse is set to get underway at approx. 11am AEST. You can purchase the fight on Main Event TV for $39.95, with coverage beginning at 10am.